Cabinets: cabinets are creamy white with feet for an unfitted look. The main cabinets go all the way up the 12 foot walls, it is quite impressive looking, but fits the style of our home. Countertops: 4 counters - unpolished black granite (which looks a lot like soapstone) marble, polished granite and stainless steel. French Doors, screen doors & back door, = Spanish Cedar. These doors were supposed to be painted, but I couldn’t cover up such beautiful wood. Our “old house” contractor uses Spanish cedar on exterior doors, porch floors, sometimes fences, as it hold up to the weather much better than other woods, however, it is pricy. We began designing a rework of our home in 2004. We actually got started in September 2006 and moved back in April 2007 under duress - it was not completely finished, but we could not stand living on top of each other anymore. It was finished by August of 2007 with me having to throw tantrums every few days at my contractor to get workers here to finish the kitchen. At one point I threatened to wear a sandwich board up and down our street, reading "you would have to been crazy to use (my contractor)"
Okay, back to 2004: The back of the house (where the kitchen is located) was okay and livable, but it did not flow or have any stylistic continuity to the front of the house, which is so amazing in itself. I felt like I was in a different house when in the kitchen. The main part of the house was built in 1890 and still has a Victorian feel, the kitchen and breakfast room and porches were built about 1920 in the Craftsman era and kept being added onto and changed ï¿½ to the point that an "extra" half bath had been added jutting out into a hallway and disrupting important flow. There were a few things that had been done that would make me stare and say "why???" The kitchen also felt very far away from the living areas of the house. The house was near museum quality in the front rooms, but it was like entering the twilight zone in the kitchen and breakfast room, breakfast room (yes, 2 of them) and bathroom(s). Our house had 2 nightmarish half baths downstairs, one of which had been built in the middle of a major passage way and was so small a space that the previous owner who had built it bumped out the opposite wall just a funky bit to accommodate the space. I would not even allow people to use that bath as it was not vented properly (think smelly) and would not flush well (think plunger). Mainly, we wanted to restore the architectural integrity to the back of the house, which included removing a diagonal path and countertop that was the main path to the kitchen, raising doorways up to 10 feet to match the doorways in the original house ï¿½ kitchen doorways etc, were all 7 & 8 feet, one directly behind a 10 foot opening, so it was readily apparent something was amiss. Another goal was getting a back door and opening up our back porch which had been totally enclosed and door removed ï¿½ the room that went nowhere with a window looking into the current kitchen. I also was determined to have French doors from the kitchen that went out to a deck which was the same elevation as the kitchen floor, to the North, shady side of our property. We hired an architect that we had worked with previously with great success - we saw eye to eye on everything. After several attempts, he fired ME - not the other way around. He would not draw what I wanted, kept giving me drawings of what he thought we should do, that we should work with what had been done to the house - "don't open the old back porch, build on a new one; put the bathroom in the old porch," etc. That was $3000 down the tubes, we were already starting out in the negative! A dear architect friend of mine said she would work on the design. She drew what I wanted. I would ask for suggestions, but she assured me that my ideas made sense and would be really improving our home. The drawings were not cheap, but it was well worth it and we are even better friends, although, I was afraid I would be fired at any moment! I have to say that I am proud of myself for coming up with this design, the architect drew it, but it was all me and my husband thinking it out and after living a year in the house, we knew what we needed and how we need it to look. I am picky if you haven't figured it out. The basis for the design was figuring out where the openings had to be in the rooms. I wanted the French doors on the north wall, we had to have the passage to the dining room, and we needed a double opening to the breakfast room. So with all that, that dictated where we could and couldn't have cabinets, a stove, a sink, etc. We were also returning the flow to the back of the house, so that made it easier to figure out where the back hall need to go and what was left over would become the new full bath. I will admit that in the days leading up to the wreaking crew coming, I was still trying to figure out if we could get a better layout out of the space. I bought most of my reproduction hardware from Van Dyke's restorers, Old House Parts, and Rejuvenation, all online. I have different types of drawer and door pulls, just one or two in key areas, to help the kitchen look as if it evolved. After receiving yet another delivery from ebay, my husband asked how many historic fixtures I had purchased, my quiet response "I don't know..."
Barndoorhardware.com - I have the horseshoe shaped hangers(part that attaches to the door), but they also have a square hanger. They slide so easily, everyone that sees them likes to play with them. There's no doubt about it they are cool - you will love them. You can also order handles, but I want something different for handles and I haven't found it yet. With my rustic theme I have been considering using antlers as handles. My screen doors don't have handles either, for the same reason! How I came to have a Lacanche range (www.frenchranges.com): One day I was researching Thermador rangers and ended up on the Gardenweb forums. Someone had written that if you are considering a Thermador then you should take a look at one of these and provided a link to a photo of what turned out to be a Lacanche range. I showed the photo to our neighbor, who we had been taking care of everyday for the past 2 years, just to show him. He was always taking cooking classes, taking photos of his food, practicing garnishes, buying every kitchen gadget on the market, etc. He had a digital Wolf range that he was in love with so I knew he would appreciate seeing this beautiful stove - I didn't know such a thing even existed. Paul saw the French Range - the Lacanche - and said "You NEED that in your kitchen!" I said "No, I don't need anything of the sort" (our previous range was 30 years old, so anything would have been better, a camping stove would have been an improvement!) and he said "You NEED that stove!" He insisted on buying me that stove as his gift to the kitchen, it was also his idea that our cabinets go all the way up the 12 foot walls - "you might as well go all the way with this." My husband likes to say he had to pay for the kitchen to go with the Lacanche! Given how my main hobby has to do with historic preservation, I knew I wanted a classic kitchen. I wanted marble countertops and inset cabinet doors and those French doors! I spent hundreds of dollars buying kitchen magazines and found several key ideas from that process. 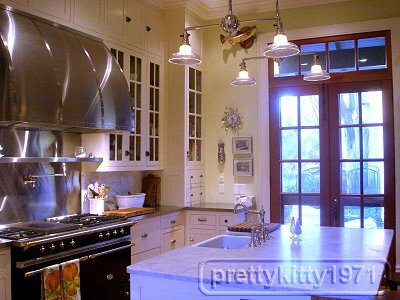 The glass front cabinets and the stainless steel countertop on either side of the French Lacanche range came from one layout I found, the open shelves from another and the pink pantry from yet another photo from a magazine (theirs was bright yellow!). Our butler's pantry was actually in our historic house plans from 1920, so we just recreated it. About our butler's pantry: the bottom 2 cabinets on the left are false fronts - they don't open - they are where the air return in located. The vents are on the opposite side in the back stair hall, so this just camouflages the box of the air return. The glass cabinets, I thought about that problem of food storage and how unattractive that is and how to make glass front cabinets work for me. I just felt glass would be more appropriate for the look I wanted - it just looks elegant to me and says "original" although I'm sure that most true Victorian cabinets had wood fronts. I planned what would go in the cabinets before we got too far in design. I have about 3 complete sets of china in addition to two sets of everyday dishes and needed a place to put/display them, so then I needed a place for food. It's hard to visualize how much space you need for food when your food is all packed up for construction! I happened to have a little nook (it was our downstairs half bath, you could get your knees knocked off if someone tried to enter the bathroom while you were on the toilet!) that we originally designed as a desk area, that I made into "the pink pantry" which actually goes around a corner and is behind the refrigerator, where all the mess of the pantry is along with microwave and toaster oven. The part of the pantry that is visible (if you're at the main sink or range)stays neat and tidy given the way that it is designed - narrow shelves for spices, baking ingredients and display. I saw it in a magazine with its Victorian-ish trim and gave it to my carpenter and he just went to work. The counter in the pantry is just wood - out of money for any other surface and since there is not a sink in there it is not a problem. It is painted pink as that is the color that my 4 year old picked out - it was a compromise as she wanted the entire kitchen to be pink! She also wanted Dora the Explorer knobs - yes, there is such a thing - but I put my foot down on that! Everyone really thought I was crazy to do the pink, I don't know how many times the painters asked if I wanted to change the color along with the green in the back hall. Now everyone loves it. Where the "extra bathroom" had been removed at the back stairs and other demolition had taken place near the new/old back door, we found exterior sub walls under the plaster and sheetrock. In old houses this material is something like 1 x 6 set on the diagonal. I had been thinking about paint colors and what I was going to do with all this extra wall and I decided how wonderful it would be if it were returned to its exterior foundations - wood siding. I love texture and my contractor thought I was nuts, but he did do the siding for me and milled corner pieces for near the back door. We painted the siding the cream trim color like the rest of our interior house. This really added a wonderful historic and unique quality to the project. The house really looks like it's evolved and been added on to in a rather careful way. When I was picking out materials for our kitchen I finally reached a moment where I was afraid that the kitchen would be nicer than the rest of the house - which I did not want at all - so I began to try to pick out elements from the original house that could be reproduced in the kitchen, if only in variation, like the wainscoting and the slider doors instead of pocket doors. We have 4 countertop surfaces(it works because you can only see 2 at anyone time), one of which is unpolished black granite, which looks a lot like soapstone, then marble, polished granite and stainless steel. I really wanted a veined marble for the island and despite everyone, even the marble contractor telling me I did not want that as my island, I got it. 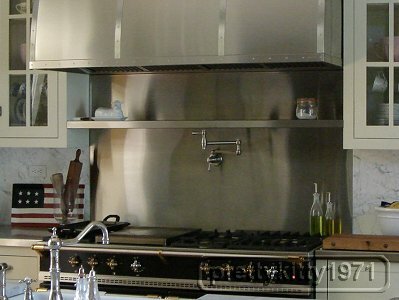 I chose polished marble on the back splash so the gray veining would pick up the gray of the stainless steel, but I also considered bead board (we used it on our butler's pantry, I really love the look and it can be an economical choice if you get the "fake" stuff) and painted pressed tin. We have the marble island and love it and all of it's etchings that my 3 kids inflict upon it. They are not really noticeable unless you look for them. We have slider doors on reproduction barn door hardware (www.barndoorhardware.com) that divide our kitchen and breakfast room. Our house has pocket doors, but we could not afford to build 2 walls, so this was another research project and something we are really happy with and that everyone marvels over. I really think it turned out better than pocket doors would have and it is unexpected, which I like. Our cabinets are creamy white with feet for an unfitted look. I did choose to get appliances that will take a custom panel, to be hidden into the cabinetry - careful if you get inset cabinet doors (where the door closes flush into the cabinet box) appliances that take a panel are designed to take full overlay doors - we just barely avoided a crisis situation that would have required me to be tried for murder. The main cabinets go all the way up the 12 foot walls, it is quite impressive looking, but fits the style of our home. Our bathroom cabinet is painted a red to give the impression of old wood - I could not afford to have "good wood" so came up with a color that happened to work really well for us. I bought most of my reproduction hardware from Van Dyke's restorers, Historic House Parts, and Rejuvenation, all online. Also Lee Valley Hardware Catalogue has some great hardward, my drop pull came from them. I have different types of drawer and door pulls, just one or two in key areas, to help the kitchen look as if it evolved (Two are fish pulls, I love them!). Our kitchen finally feels like it goes with the rest of our home. fish handle - everyone loves this one handle in the middle of all our Victorian cup pulls and amethyst knobs! Some other creative things that worked out really well for us: you will notice in the web pictures that originally there were 2 windows on the wall where the stove goes. The outside of our house is a rough stucco (it was "smothered" in stucco about 1920, the Victorian gingerbread and elements are under the stucco - visible in our attic!) and I doubted that my contractor could match the stucco to my specifications - we had already had previously unsuccessful attempts on other stucco repairs. On the outside of our house, the windows appear to be there - I had wood shutters installed in the openings, the windows simply look shuttered. It-s a nice touch to our exterior and I did not have to worry about the stucco being less than perfect. One reason our glass front cabinets look so nice is that the shelves all line up across the horizontal mullion piece, so it makes quite a uniform look. The shelves are actually adjustable, but I will never move them as it looks just “wrong” (to me anyway) to have the shelves out of line with the mullions. Same thing with the butler’s pantry. We had a TON of ups and downs with our project. We were supposed to be in construction for 4 months, but it really took a year and we were out of our home 9 months (we moved in with Paul our next door neighbor - all 5 of us!) Toward the end, May 2007, I actually said to our contractor over the phone, in my most stern and reprimanding voice "it's hard to appreciate how beautiful you have made my kitchen when you keep screwing up even the new stuff that you put in!" His response, "I know." He did not want to put the siding on the wall, but later came back and asked me if "he" hadn't had a good idea(he was kidding, telling me I had done good). Ask me sometime about what happens when the concealed appliances don't fit far enough back into their holes! Love It! What a great trasformation ! Do you mind sharing more information about your cabinets? Were they locally made? 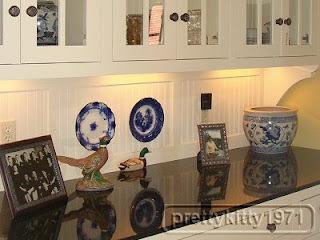 the cabinets were custom made by a local cabinet maker/woodworker. Our architect has found that in many cases it can be less expensive to have cabinets custom made instead of buying prefab from local home centers. To answer Poodle's questions: I think my order of counter surfaces would be 1.Stainless, 2. unpolished granite, 3. honed marble. 1.The stainless does scratch a bit, but I really enjoy the sturdiness and industrial aspects of it. I don't give a second thought to putting items on it. 2. the unpolished granite, it's primarily a beverage serving area, but I like the flatness of the color and the ease of cleanup and not worrying about it. 3. Marble island: even though this comes in 3rd in my survey, I still really love the look and feeling it gives me for what I wanted for my historic kitchen. I am careful with it, avoiding slicing citrus on it, laying out dish towels to set things on it. It has been "stabbed" multiples time by one of my children who neglected to use a cutting board under some frozen cheese she was prying apart, but it only adds to the look - she kept reminding me I wanted it to look old! We do enjoy all the surfaces and have no regrets in choosing them.